The main types of door knobs are the round knob, the oval or egg knob, and the lever. Each have their merits. Levers are the easiest to operate for both the elderly and young. If you have toddlers or young children running around the house, they can easily open doors operated by a lever once they can reach the handle. Oval knobs or egg knobs are not as easy to operate as a lever, but still easier than the round knob. While shopping around for door knobs, consider how you may be able to secure a door to prevent a child from accidently running out. 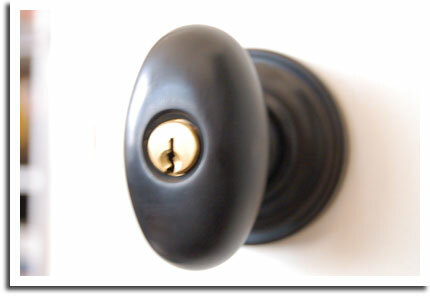 The traditional plastic door knob covers designed for round knobs may not fit on an oval or egg knob. For levers, you may be able to find a child-safety lock at your local hardware store.